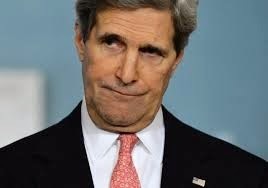 John Kerry is a useful idiot at best. He should go to Iraq and Syria and personally negotiate with the peaceful Muslims there. “I want to take advantage of this podium and of this moment to underscore as powerfully as I know how, that the face of Islam is not the butchers who killed Steven Sotloff. That’s ISIL,” Kerry said at a ceremony honoring Shaarik Zafar, who was just appointed as the State Department’s special representative to Muslim communities. “The real face of Islam is a peaceful religion based on the dignity of all human beings,” Kerry said. “It’s one where Muslim communities are leading the fight against poverty. It’s one where Muslim communities are providing basic healthcare and emergency assistance on the front lines of some of our most devastating humanitarian crises. And it is one where Muslim communities are advocating for universal human rights and fundamental freedoms, including the most basic freedom to practice one’s faith openly and freely.